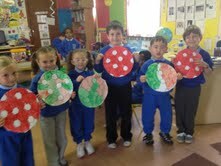 We are learning all about the countries that are taking part in the Euro 2012. We designed some great looking kits for the teams in the competition. We painted some soccer balls in the colours of the teams we are going to support. We all hope Poland and Ireland do very well. We think the teams would like our artwork.